I grew up in a family that always had a dog. We had Sheppard’s and once we even had a giant poodle. We named him Expense. But dogs in our family didn’t live in the lap of luxury. They ate table scraps for the most part and for the rest they beat the streets, so to speak. They stayed outside no matter what the weather and I came to know that my dad just tolerated them. He didn’t like dogs but he had nine children and felt that a dog was a must. As for cats, they were the scourge of the earth. My dad would no more have had a cat than live underground. As much as he disliked dogs, he hated cats. Not surprisingly, I grew up an avid dog and cat hater. There wasn’t a single thing about them that I could stand. It creeped me out to have a cat rub up against my leg. I felt like throwing up if a dog licked me or put his cold, wet nose on me anywhere. I couldn’t even stand the feel of cat or dog fur. And I absolutely could not abide the smell of dogs. If I was in the same room with them I could smell them and it was disgusting. But I had seven children and a husband who loved dogs so like my father before me we had dogs and I couldn’t stand them. I was not cruel but I was not kind. I wasn’t terribly harsh but I wasn’t gentle either. When I was in my fifties I had a dear friend named Ruby. She raised little dogs and she was dying. 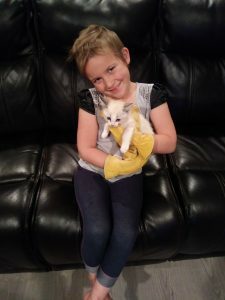 She had daughters who also raised little dogs and she knew they would take her dogs. But she had this big old grey cat named Big Kitty. Her girls were not interested in that scruffy old cat. So Ruby asked me to take Big Kitty. I agonized over what to say. So did my husband because he also disliked cats. Nevertheless, for the sake of a dear friendship, we took the cat. He lived with us for a few years. 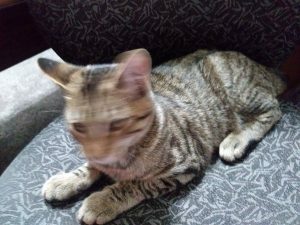 In that time, for Ruby’s sake, I made a decision that I would care for that cat and I did. But I could still barely tolerate dogs. Then we moved from Montana to Utah and lived with our daughter and her family. She had a timid little dog named Odie. He was a small dachshund and he was terrified of me. He had good reason. I called him dumb dog in a loud and irritated voice on many occasions. Other people loved animals. Why didn’t I? Then one day I made a decision. I decided that I didn’t want to dislike cats and dogs anymore. I had watched other people and they loved their dogs and cats. I began to think that I might be missing something. But how in the world was I going to find out if I couldn’t get over my aversion to the smell and touch of an animal? Because I am a praying person that’s what I did, I asked God how I could come to like animals. The first thought I had was to make friends with Odie. So every day after work I would come into the yard, call Odie and then touch his head. As he came to me he walked on his short little legs like a condemned man heading to the gallows. And when I reached out to touch his head he would pull back a bit. Poor little guy. I could barely touch his head and give a little pat. That was all I could handle. As the weeks went on I went from barely a touch on the head to an actual pat and then to stroking him once or twice. I did this for many weeks and then one day I sat on the back steps, pulled him into my lap and sat there for a few minutes. I didn’t pet him but I held him. It’s well to remember that I couldn’t stand the smell of dogs or the feeling of their fur so this was huge!! Eventually, Odie and I became friends. I felt tenderness for him. I never touched him a lot and we didn’t pal around but we became friends. 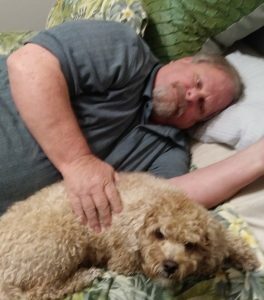 During this time our last child left home and Don, my husband began to long for a dog. I dreaded that. It’s one thing to be friends with someone else’s dog but it’s another to live with one. So I stepped up my prayers. I began telling myself that I liked dogs. They were man’s best friend after all and if they were man’s best friend they could be woman’s too. I petted all of my client’s dogs. I talked to the neighborhood dogs. I patted them and then one day Patch came to live in our home and guess what! I like Patch. I can pet him and I’m not grossed out. I do still avoid his wet nose but I like him. I am kind. We are friends. In fact two days ago I went back to bed. I get up very early and walk with my daughter but this day I was tired so I went back to bed. After I let Patch out in the morning he runs and jumps on our bed and snuggles with his pal, Don. This morning, the morning I returned to bed, he had his side pressed up against Dons back. That meant he was sort of on my side. I looked at him and thought about tossing him off. But I got into bed, turned over and went to sleep. You cannot imagine how amazing it was to me to be in the same space with a dog and be able to sleep. At this time we also have a cat who lives with our daughter . He has decided that my office chair is his personal retreat from children and noise. I let him have it! Jax on my office chair. So what happened between finding cats and dogs absolutely disgusting and becoming their friend. It was a decision. I decided to change my story from dogs and cats are filthy and disgusting to dogs and cats are wonderful animals and I am OK with them. I am not yet Patch’s pal. I don’t hold him on my lap but I pet him. I don’t talk baby talk or feed him from my hand or sleep with him. But I like him. He’s a good dog and I find this particular miracle wonderful. 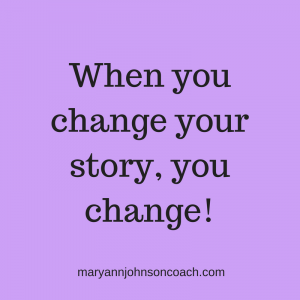 Here is the truth – When You Change Your Story, You Change! 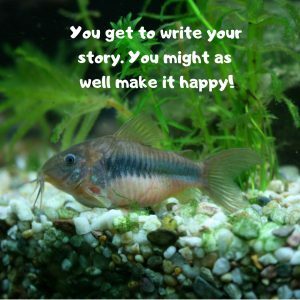 When I changed my story about animals and about how I wanted to see them, I experienced a change. Understanding that your story can and does influence your response to your spouse, your children and yes, even to cats and dogs is powerful and frankly, life-changing. Does this ring true for you? Please share your feelings with me by leaving a comment. P.S. You can learn more about controlling your thoughts and emotions for better family relationships in my new book Becoming a Present Parent, Connecting With Your Children in Five Minutes or Less. You can also receive a chapter from the book on Touchpoints, creating points of connection rather than having points of contention, FREE by visiting becomingapresentparent.com It can be life-changing for your family. I promise!